At the LCA Conference, Jennifer Pletcher and I (her daughter Finley, has LCA) were chatting about fundraising. Jennifer and I have been communicating back and forth the past year or so, I'm still bummed they live so far from us. We think a lot alike, and have the same goals with fundraising, etc. I decided to form a website to share our fundraising ideas that we have done in the past, that has worked for us. I also hope others can share their LCA fundraising ideas with us, so that we can post the ideas on the website. I am always looking for a fun, different way to draw funds in. My family and I find a balance to be able to raise money through fundraising AND also focus on Gavin, and give him the best that is possible. Our fundraising events have pulled so many people together, our family has a blast volunteering, and helping. It's encouraging to know you are trying to just do something to help the situation, which has caused my son to be blind. Please beware, I am still working on the "prettiness" of the site. I haven't had much time to get it looking the way I want it to, but the content is there. Yesterday was Gavin's first day at BCLC. BCLC is in Santa Ana, it's a little drive for us - but worth it. He will be going once a week for occupational therapy. This has been a long time coming, and I wish he could have started there sooner, but some things are out of my control. Needless to say, I am so excited for him! Yesterday he did great. Of course with a new facility, new people, it took him a while to get used to. He was hesitant and started with the death grip around my neck with two hands, 10 minutes later we were down to one hand (while the other hand was playing), and another few minutes later, he was on the ground playing. I was able to step back a little. I brought Landon with us, in hopes that it would help him to be more comfortable, and it worked. Landon helped Gavin, and another few minutes later, all three (including our new therapist) were all playing, laughing, and singing. We stuck with toys that he is used to, to bring the comfort level to a good point. We did not want to introduce anything that would scare him. Yesterday was a day of exploration for him, and one day down in attempts to get him comfortable there, by having it be full of fun. They played with the balls, drums, and I could not peel him from the dizzy disc. We are going to have to buy this for him, at home. He did not like sitting on it (yet), rather he spun it around and around. He liked the sound, and was easily manipulated by his small hands, and didn't take a lot of strength. Landon got on it, and we made a game out of Gavin spinning his brother. ONE - TWO - THREE - SPIN. We said that about a hundred times. It took me another 10 mintues to break him away from this. It is looking like he is left handed dominance so far, let's see how that pans out. I will try to do a post every week, with new things Gavin is doing at therapy, so maybe you guys out there can learn something new, that I am learning along with him. His OT is wonderful, she knows exactly how to interact with Gavin, ways to approach him that are not scary, and she instantly knows when to pull back when he is not receptive. Her key is to give him the self confidence he will need to continue to successfully explore his world. I cannot tell you how proud and excited I am for him, for this new path. I have a feeling she will take Gavin to the next level of development, through play and self confidence. I also am looking forward to the knowlege I will gain, so I can continue these techniques at home. He is still receiving home services from Braille Institute, his early intervention teacher, Vision Impairment teacher, and soon O&M (Orientation and Mobility). BCLC we actually travel to once a week, and it's pretty nice to have him get services out of his home, and a new environment (for both of us). 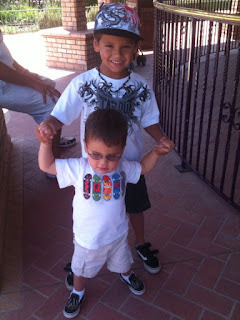 As for Gavin and Landon, they are starting to become closer buds. With Gavin getting older, they can interact a lot more, wrestle, and give mom a heart attack. Guess that comes with the territory of boys. Landon is so patient, and helps so much with Gavin, as far as guiding him and making sure he is safe. They have had a lot of fun this summer. I look forward to watching the relationship develop! This past weekend was the LCA Conference. What an experience. Not just with gaining knowledge with the medical information presented. The connection to the other families, is very hard to describe. Pretty much every person attending had a child who was blind/visually impaired due to LCA. There were over 100 families (I believe) that attended. There is an unspoken connection you can feel amongst everyone. We have all probably felt 'something was wrong', we have all been given the diagnosis about our child. We have all heard those words there is no cure, and I am sure we have all experienced the roller coaster of emotions that come with that diagnois. In addition to all this great news, we came to the conference not knowing which gene has caused Gavin's blindness. There are 15 known genes that cause the LCA disease. We have been waiting since Dec. '09, which is when we submitted his blood work to the Carver Lab at the University of Iowa. The Carver Lab is where Dr. Stone is doing all the research, to find which gene is causing LCA in the individuals affected. Typically, it takes a few months. Out of those 15 genes, they are really focusing efforts on the RPE65 gene. That is the gene they have actually have success via gene therapy. Corey Haas, the little boy I wrote about before, has the RPE65 gene AND was the youngest in the world to receive gene therapy. His vision has improved in the eye in which was treated. It's a fascinating story, and so inspiring, and I could have hugged that family this entire weekend. Like Dr. Bennett said, Corey, and the Haas family, are the true pioneers. Back to Gavin's gene. We had a chance to meet with Dr. Stone this weekend. I had a few questions for him (what a kind man). He ended up making a phone call to the lab, and we ended up finding out from Dr. Stone, that Gavin's gene is one of the unidentified genes. Which means, for those genes that they know about, Gavins is NOT one of them. For an odd reason, I had a funny feeling this was the case. I told our family members that I think Gavin's gene is not one that has been identified, or at least that would be our answer from Carver Lab. And so it is. This means a few things. I will divulge later when I can. But for now, we are already doing some more research on getting an answer, our blood work will be moved to a second phase of testing at the lab. This can take months. Of course I am anxious to find out what gene he has, so we can move towards the funding of the researchers working on that specific gene. We can't do that without knowing the gene. There are some people who don't sense our urgency, and that is ok. But with every discovery of each gene, it can potentially blow open the doors for all the others. Hence, the name Project 3000, that Dr. Stone heads. Their philosophy is to find all 3,000 people in the country who have LCA, so they can test their gene. I may be losing you, I enjoy the medical, gene information. I can go on and on, but will save that for later. In an ideal world, we would have loved to have been given a gene. I know at some point, ALL genes will be identified. But for now, only about 80% are known, which is about 15 genes. Gavin's gene is not one of those known. This means we work harder, better and more efficient with our fund raising, so when the time does come, we are ready. Ready to fund the researchers and scientists. I have to admit, although I had a feeling Gavin's gene would not be identified yet, it was still a little difficult to hear. Either way, it doesn't change things today. Our objective is still the same, and we will continue the march ahead with hope, persistence and above all, optimism. I have hopes that through our fundraising, and raising awareness, we will not just be trying to help Gavin. We will be helping all those affected!